I got a call from Mommy today!!! They got hers and the baby’s infection under control and think they will send Mommy home tomorrow (Sat). CJ said her appetite, which had been a roller-coaster since the onset of her pregnancy, literally returned to normal as soon as they took the baby and closed her up. She couldn’t wait to get back to her room and get something to eat! Baby Rhonda will have to stay for about 8 more weeks until she’s fully developed, but CJ says she looks great and is even trying to pull her monitor wires and tummy tube out, and is kicking and flopping around like a tadpole out of water! They have a naval tube in her tummy to feed her for now. CJ decided not to pursue breast-feeding, in light of the fact she would have to run back and forth, pump apparatus, collecting milk, etc, and doesn’t think she’s up to all that and would rather they start her on a bottle when the time is right. I was going to pack DD18 in the car and head down middle of next week but CJ said to wait, and unless she gets sick or something changes, she’d rather I wait until the baby shower in April, so I’ll have to content myself with waiting on news between now and then. I’ll post pictures as soon as I get anything from down there~ wish us luck!!! 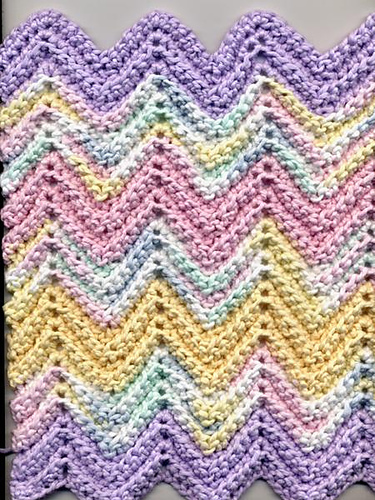 This is the pattern thus far on the baby blanket I’m working on. I’m on repeat #2 and most likely will need more yarn-I made it bigger than the original pattern called for, that last one I did for Hunter was a doll blanket when I got done, pffffffffft. Hopefully I’ll have photos soon, DIL said she got something but it was fuzzy and too many hands in the way, so I’ll wait until someone else sneaks a shot from the Neonatal Unit. Thanks everyone for your thoughts and well-wishes, they are much appreciated!!! Previous Baby Rhonda is here~ Next Pictures of Baby Rhonda at Last! !